That's why we're offering you six different ways to finance your new Suzuki. 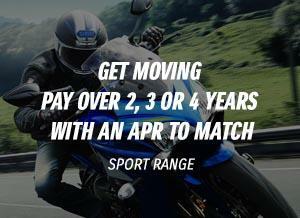 Just decide whether you want a PCP or HP deal, then choose to pay over 2, 3 or 4 years with an APR to match. £300 minimum deposit. Terms and Conditions Credit is available to UK residents aged 18 and over, subject to status. Suzuki Financial Services Limited,St William House, Tresillian Terrace, Cardiff, CF10 5BH. Available on applicable models purchased and registered between 01/07/2018 and 30/09/2018. This offer may be extended or withdrawn at any time. 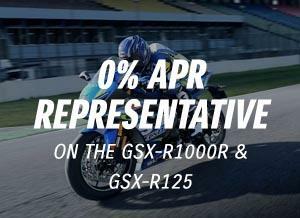 All new Suzuki On-Road motorcycles officially imported into the United Kingdom by Suzuki GB PLC and first registered in the UK between 01-01-2016 and 31-12-2018 will benefit from an additional one year extension to the normal Two-Year Suzuki Warranty, such one year Warranty extension to apply subject to the following conditions: Warranty extension only applies to such motorcycles which are regularly serviced through a UK Authorised Suzuki Dealer, in accordance with the schedule in the Owner's Manual; and in the UK only, for one year commencing from expiry of the normal Two-Year Suzuki Warranty, and only for motorcycles which are kept in the UK during the Warranty extension period; If you are a consumer, this extended Warranty is in addition to, and does not affect, your legal rights in relation to products that are faulty or not as described.